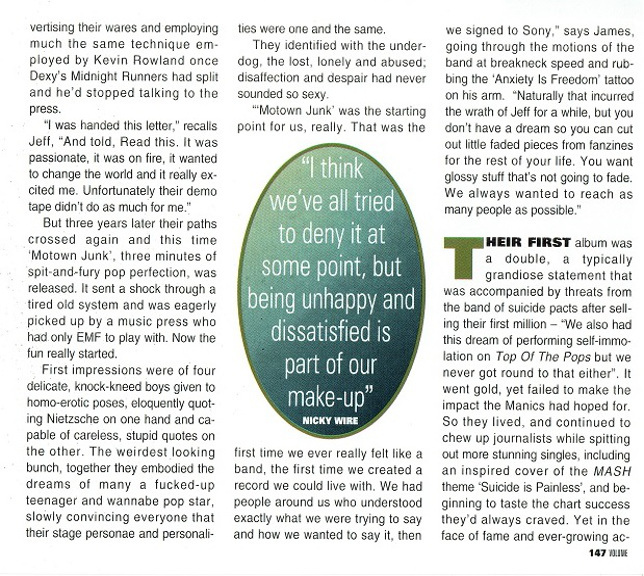 Title: "I Think We've All Tried To Deny It At Some Point, But Being Unhappy And Dissatisfied Is Part Of Our Make-Up"
Their first album was a double a typically grandiose statement that was accompanied by threats from the band of suicide pacts after selling their first million - "We also had this dream of performing self-immolation on Top of The Pops but we never got around to that either." 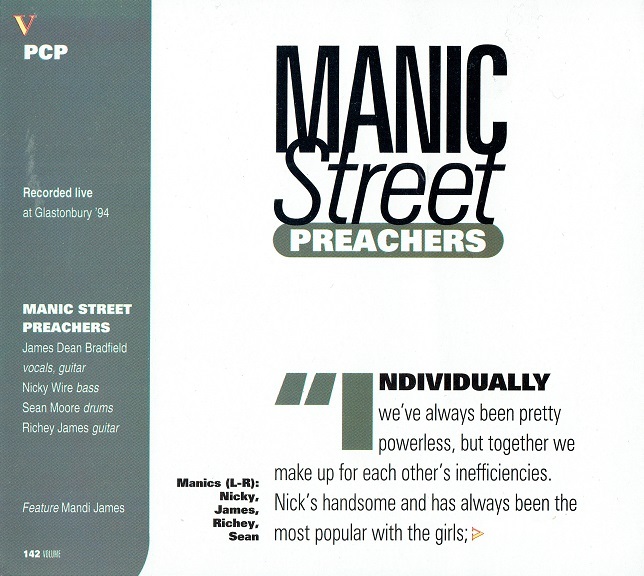 It went gold but failed to make the impact the Manics had hoped for. 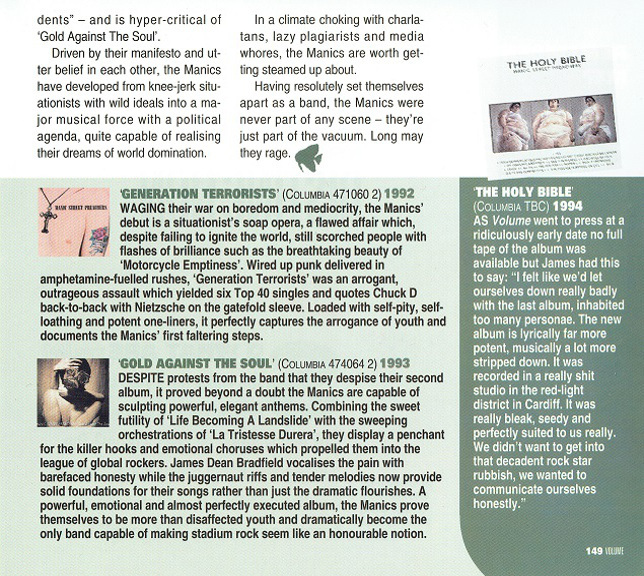 so they lived, and continued to chew up journalists while spitting out more stunning singles., including an inspired copy of 'Suicide is Painless', and beginning to taste the chart success they'd always craved. 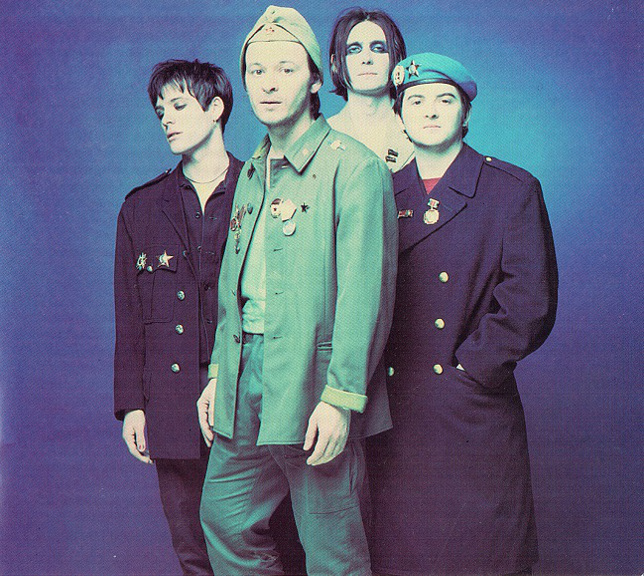 Yet in the face of fame and ever-growing acclaim, the Manics resolutely refused to cheer up or cut loose. 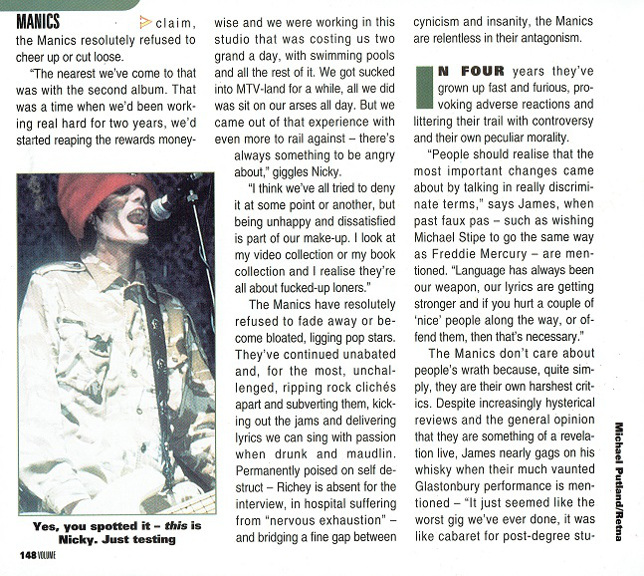 "The nearest we've ever come to that was with the second album. That was a time when we'd been working really hard for two years, we'd started reaping the rewards money-wise and we were working in this studio that was costing us two grand a day, with swimming pools and all the rest of it. 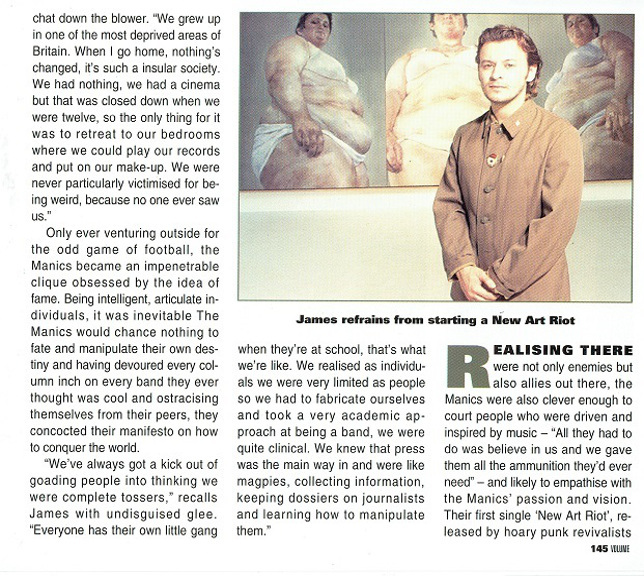 We got sucked into MTV-land for a while, all we did was sit on our arses all day. But we came out of that experience with even more to rail against - there's always something to be angry about," giggles Nicky. "I think we've all tried to deny it at some point or another, but being unhappy and dissatisfied is part of our make-up. 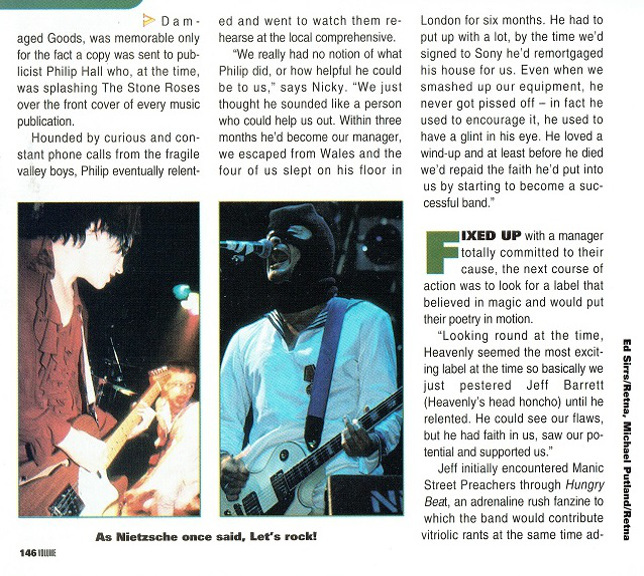 I look at my video collection or book collection and I realise they're all about fucked-up loners." 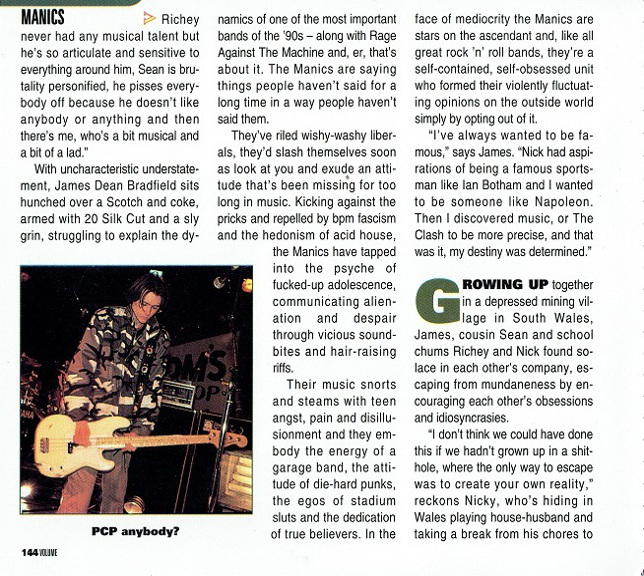 Having resolutely set themselves apart as a band, the Manics were never part of any scene - they're just part of the vacuum. Long may they rage. This page was last modified on 15 May 2018, at 06:39.